Many adults are not happy with the way their teeth look; in fact, they're very self-conscious about it. Some even reflexively bring their hand up to their mouth when they smile to hide misaligned teeth. If this describes you, please let us help you smile freely again. Giving you a smile you can be proud of may take less time and be less expensive or intrusive than you think. That's because orthodontic treatment no longer has to involve metal braces in every case. Some treatment options are virtually invisible. One of those options is Six Month Smiles®. Yes, it's actually possible to have straight teeth in six months if you are a candidate for this modern, innovative form of orthodontic technology, which we are happy to offer here. 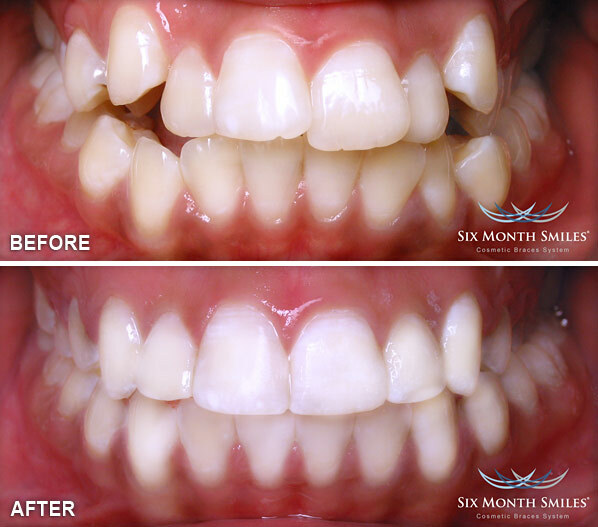 Six Month Smiles is less expensive than Invisalign®, takes less time, and can achieve beautiful results. Yet it is almost as invisible as clear aligners. Six Month Smiles is like traditional braces in that it makes use of brackets and wires to apply gentle forces to your teeth, moving them into a better alignment. But in this case, the brackets are clear and the wires are tooth-colored (click here to view a patient wearing Six Month Smiles®). The forces used to move your teeth are actually lighter than with traditional braces, making Six Month Smiles a comfortable, low-risk orthodontic treatment. The reason results can be achieved in so short a time is that Six Month Smiles moves only the teeth that show in your smile. It is not designed to realign your whole bite, as traditional braces and Invisalign clear aligners are designed to do. Six Month Smiles offers a result that is purely cosmetic, but that may be all you need to achieve the smile of your dreams. Of course, as with any form of orthodontic treatment, you will need to wear a retainer for some period of time afterward to solidify your new and improved smile. Is It Your Best Option? The only way to know for sure if Six Month Smiles would work for you is to come in for a consultation. By examining your bite and discussing your goals with you, we can determine if this form of orthodontic treatment would provide you with the results you seek. The important thing is to bring back your self-confidence — along with the joy of smiling.